the Battle of Britain (1940) on 15 September. But some people liked him for it. Shadow equalities minister Kate Green, and some MPs who didn’t have the guts to reveal their names, sniped at Corbyn in the right-wing warmongering Daily Mail. So did George Galloway, the former Labour and Respect MP, who said it was a mistake not to sing the national anthem, although he would have done so “without any gusto”. Jim Sillars, the Scottish socialist politician, implicitly defended Corbyn. Responding to a claim in the Daily Telegraph that singing God Save The Queen is “a sign of loyalty”, Sillars wrote that “there should be no loyalty test in a democracy” and “why should I and other republicans sing a song that appeals for a monarch long to reign over us”. The row rumbled at a meeting of the Parliamentary Labour Party on 15 September. Simon Danczuk MP asked Corbyn to “promise” that he would not wear a white poppy at the Remembrance Day event on 11 November. The white poppy was launched in 1926 by the Co-operative Womens Guild and the No More War Union, to commemorate all victims of all wars, as an alternative to the red poppy, issued by the British Legion (a semi-official military veterans’ organisation) to commemorate only British military personnel. I remember the white poppy being quite a common sight in the 1970s in the week prior to Remembrance Day, which marks the anniversary of the 1918 armistice that ended the first world war. 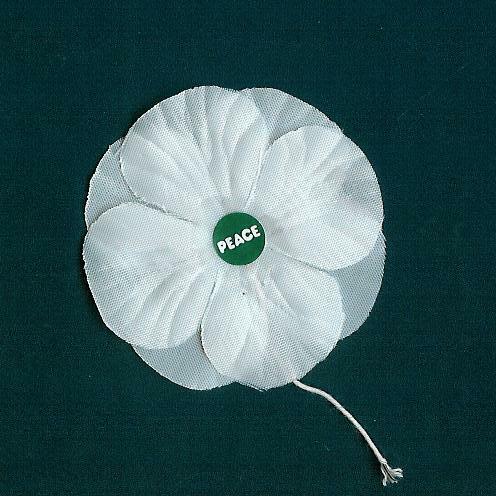 Since the revival of British militarism in Iraq and Afghanistan, pacifists have worked to popularise the white poppy again. Corbyn, who has previously worn red and white poppies together, told the Parliamentary Labour Party meeting that he had not decided what to do this year, and (according to a Channel 4 report) explained “at some length” why people wear white poppies. I’m inclined to believe that. Not only is the parliamentary Labour Party full of supporters of the arms trade and militarists who voted for the monstrous UK-US assault on Iraq, but it also seems credible that many of them are so distant from socialist and pacifist traditions, and so stupid, that they need the point of the white poppy to be explained to them. It’s not clear whether those bloodthirsty Labour militarists persuaded Corbyn to drop the white poppy. But the right-wing London Evening Standard, which had been campaigning on the issue, suggested that they had, and claimed that a Corbyn spokesman “said firmly that he would ‘only wear a red poppy’”. Who cares? It’s only a bit of plastic, right? Are there not more important priorities? That was a conversation that came up in our house at the weekend, when one of our closest friends – let’s call her Lynn – enthused about Corbyn’s chances of becoming prime minister after the next UK election in 2020. “My friends and I are rejoining the [Labour] party. I want to get into the policy discussions”, said Lynn, who was an active Labour Party member in the 1970s and 80s, before Tony Blair swung the party rightwards. Her hope is that a revived Labour could mobilise young people who have never voted – the sort who turned out for Barack Obama in the US presidential election in 2008 – and produce a left Labour government. We talked about how brilliant it is to have a leading politician refusing to sing the national anthem. I said, though, that I was disappointed that Corbyn had backed down over the white poppy. Of course it’s only a bit of plastic. But for someone like me, who has a much more limited view of parliament’s role in changing things, such symbols are perhaps even more important. If Corbyn seriously means to do anything, he surely has to start by refusing to get sucked into the game of pleasing the right-wing press in order, allegedly, to please the electorate. If he goes down that road, he will soon be backing down on far more important things. Of course it’s entirely possible that a “Corbyn spokesman” has dumped Corbyn in it, promising to abandon the white poppy in the face of aggressive questioning from a journalist, and presenting Corbyn with a fait accompli. Members of the Cooperative Womens Guild, which launched the white poppy in 1926, with a wreath, some time in the 1930s. democratic ones. But all the same he often gets screwed by his staff, by parliamentarians, by the military, by the press and his own PR people. And real life is definitely a hundred times worse than a TV show. In my view the potential of a Corbyn-led Labour Party lies not in the hope of implementing a radical anti-austerity programme in government, since – even if that programme survives the right wing’s ceaseless barrage between now and the next election – his ability to implement it will be constrained by many other factors about which we already know. A more tangible benefit would be if Corbyn could right now bring principles such as anti-militarism back into the foreground of British political life. That is why the white poppy matters. Moreover, the only way a future Corbyn government’s room for manoeuvre might be widened is if the social and labour organisations outside parliament gain a real strength that they have not had in the UK since the 1980s. The main point of such movements, to my mind, is to bring about social and political transformations on a scale not possible through parliament. But if, as a by-product, they open space for some Corbyn-ite reforms, all well and good … as long as there is no price to be paid in terms of activists being sucked into the logic of parliamentary compromise. Is a pacifist symbol really for socialists, though? Surely we are in favour of the right of the oppressed to revolt, aren’t we? So in November I will wear a white poppy with pride. I have ordered one from the Peace Pledge Union. Readers in the UK might think about doing the same. GL, 21 September 2015. ■ The Royal British Legion was last year accused of emasculating the pacifist message of The Green Fields of France, an anti-war classic. Perhaps that shows that symbols are important. ■ Members of Veterans for Peace UK, an anti-war group comprising former British servicemen, wear the white poppy. ■ The Black Poppy Rose group (see their public facebook page here) remembers black people who have “fought, fallen and sacrificed in colonial wars”. ■ Jeremy Corbyn strikes a blow against Blair-ism. And now what? – 13 September 2015. 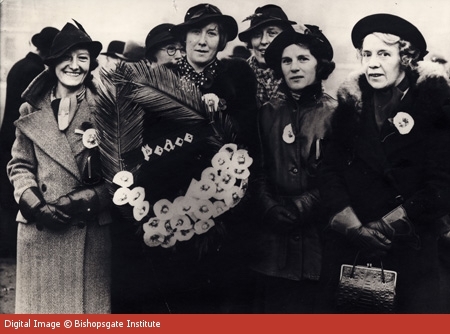 The photo shows members of the Co-operative Womens Guild (CWG) holding a wreath of white poppies in the mid-1930s. The CWG was founded in 1883 to “educate women in the principles and practices of Co-operation and to work for the improvement of the status of women”. The guild initiated the white poppy, and was then joined by No More War Union and Peace Pledge Union. Photo from the Exploring 20th Century London web site. This entry was posted on Monday, September 21st, 2015 at 7:38 am and is filed under Social and labour movements. You can follow any responses to this entry through the RSS 2.0 feed. You can leave a response, or trackback from your own site. Thanks for this interesting post. I didn’t know about the black poppies. I will try to get one and a white one as well.